Elie was a veteran educationalist, a vociferous trade union leader and a champion child rights activist till his last breath. Elie served as a founding member of Global March Against Child Labour in 1999 and went on to becoming its Chairperson in 2015. After his studies in France at the Ecole Normale de Rouen and the Institut d’ Etudes Politiques de Paris, Elie became a primary school teacher, and he quickly became active in one of the national teachers’ trade unions, SNI-PEGC. In 1978, he was elected National Secretary of the French confederation of education unions, Fédération de l’Education Nationale (FEN), known today as UNSA-Education. In October 1999, Elie joined forces with the Global March Against Child Labour to organise public pressure on governments to fulfil their promises to provide free, quality public education for all. This was the founding meeting of the Global Campaign for Education (GCE). 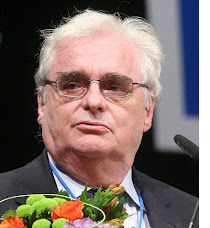 Following his retirement from Education International in 2008, Elie continued his role as a Board member for Global March, working closely with fellow GCE founder and Nobel Peace Prize laureate Kailash Satyarthi. In 2015, Elie became the chairperson of Global March, and represented Global March on the GCE Board at its latest meeting in October 2016 in Johannesburg, South Africa. At Global March Against Child Labour, we will be forever indebted to the wealth of knowledge, constructive advocacy and enthusiasm that Elie taught us and we all will always remember him for his sweet sense of humour, conviction and dedication towards his work. Kailash Satyarthi, Honorary President of Global March Against Child Labour in paying tribute to Elie, stated: “Elie and I fought many battles together for the right to education for all children, and the void that I feel will not go away. We must take inspiration from his glorious life and keep on fighting, and reinventing something new to make this world a better and fairer place for children." We at Global March send our sincere condolences to his wife, Marie-Claire, and his family, and stand united in this deep hour of sorrow.